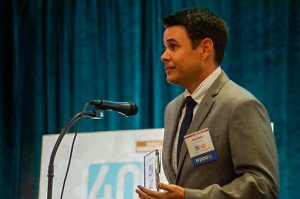 Randy Goins, Founder and President of TriMark Digital, was recently awarded with Triangle Business Journal’s 40 Under 40 Award. This honor recognizes remarkable professionals under the age of 40 for their contributions to their organizations as well as to the community. The finalists were narrowed down from more than 200 nominees down to 40 by five judges from local businesses in the area. With this recognition, the opportunity came to help raise funds to build a home for Habitat for Humanity of Wake County. Through independent efforts, Goins raised over $7,600 to provide shelter to a family in need. Collectively, Triangle Business Journal and all of the 40 Under 40 winners raised over $30,000. Goins founded the company in June of 2006 with one employee and the company has since grown to 48 full-timers. TriMark Digital is a full-service, integrated digital agency serving well-recognized clientele like Kohler, Papa John’s of the Carolinas, Pinehurst Resort and more. Click here to see this year’s list of the Triangle Business Journal’s 40 Under 40 award winners. Triangle Business Journal is the leading provider of local business news in the Raleigh-Durham-Chapel Hill area of North Carolina. A multimedia platform delivering business news, and also the publisher of a weekly business paper, the TBJ also publishes the annual Book of Lists highlighting the hottest area companies in their fields, organized by ranking. The TBJ shares daily breaking news about area businesses, award news, event listings and other helpful resources for those driven to lead in the Triangle region.